Q: Is there a way to add bates number to a PDF document in PDF Studio? A: Yes, bates numbering can be added to any PDF using PDF Studio. “Bates Numbering” is used in the legal, medical, and business fields to apply a unique identification number with an additional custom alphanumeric prefix or suffix on documents as they are processed. The unique numbers allows you to easily refer to a specific page of a specific document just by referencing the bates number (i.e. Marbury v. Madison 000436). Bates numbers can be added as a header, footer, or watermark onto the page and can be applied to either a single document or a batch of documents. Set the desired Header & Footer or Watermark options. A name for a profile can also be set during this step to save the settings to be reused later. Note: You do not need to create or save a header and footer profile before applying them to a document. To save the current header and footer configuration, click on the Save button and enter a name. To add a Bates Number click on the “Bates Number” button below the text field. 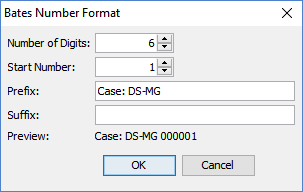 This will display the bates number format options. Once done, click “Ok” to apply the settings.